I just love girly lunches. 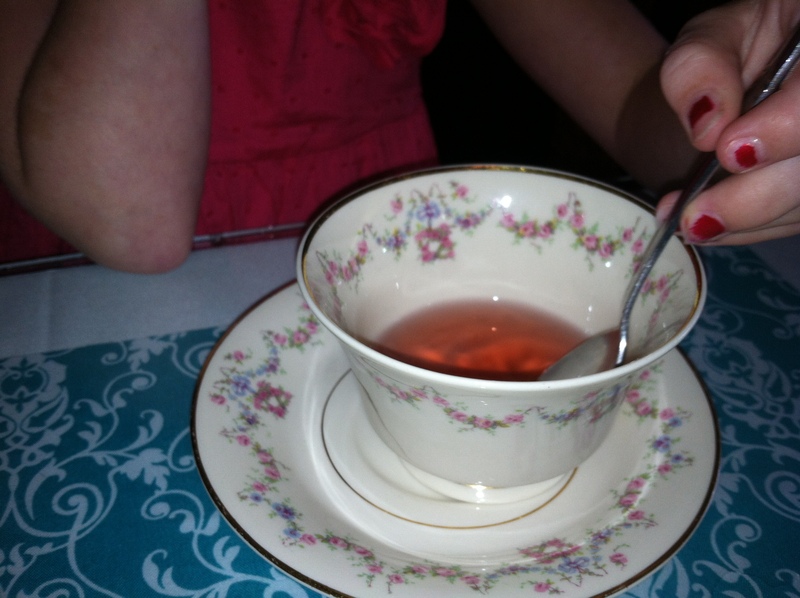 So Lil Miss Foodie, MomFoodie-in-Law and I recently took advantage of a Living Social Deal and enjoyed quite the decadent lunch at Pegg House Tea Room in Kernersville. This charming, old Victorian harkens back to 1885 and the decor captures times gone by. Our “deal” was for Tea for Two, which is basically double the traditional “High Tea” that they offer during lunch service. In addition to our High Tea, Lil Miss Foodie ordered the Chicken Pie, which had flavorful chicken in a rich, creamy broth and a flakey crust. Very old fashioned, very satisfying and homey. It was served along side a salad. 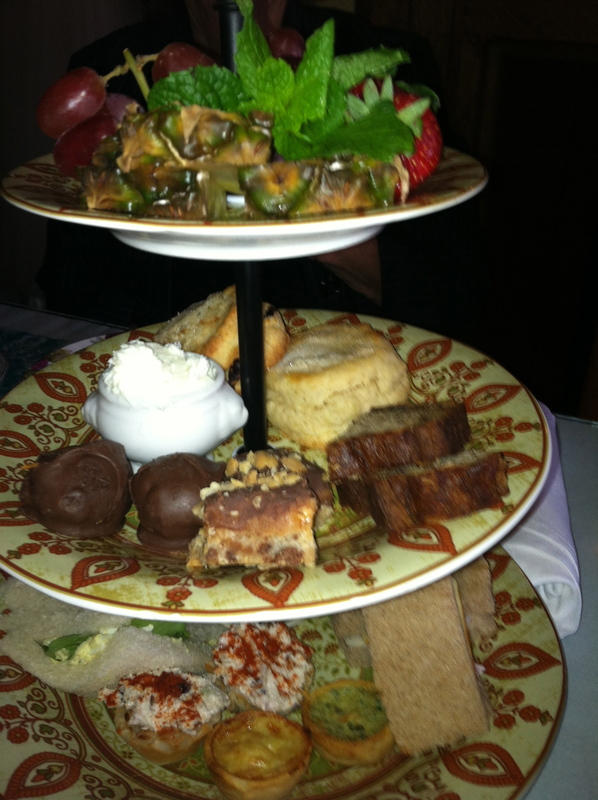 Our High Tea for Two came with two of everything. Think finger sandwiches like cucumber and cream cheese, smoked turkey with cranberry spread and egg salad; and chicken salad in mini phyllo tartlets, tiny pastries and fruit and homemade scones. And of course, Devonshire cream to smear on anything you wish. We were hungry so it’s a good thing it was a deal for “two.” Unless you want to eat very light, the normal High Tea for lunch may not be enough to share as it doesn’t have two of everything. 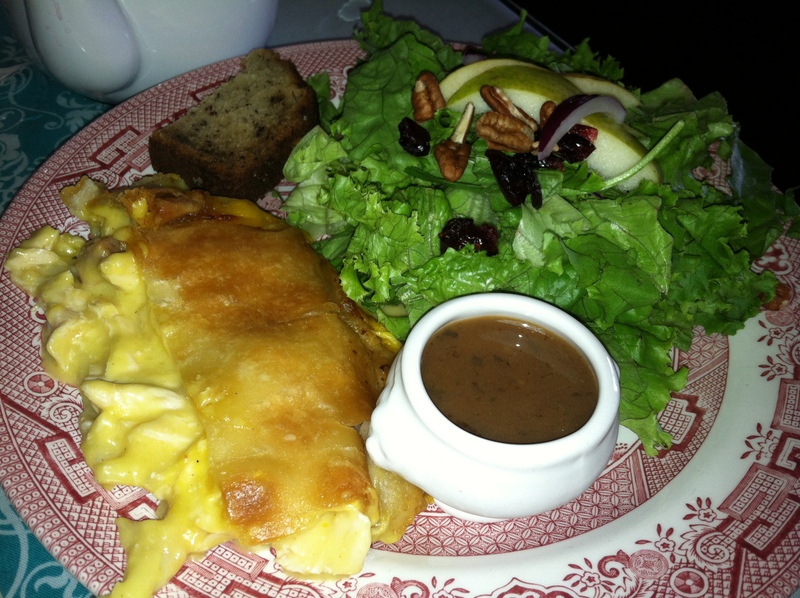 But Pegg House has a wonderful assortment of wraps, sandwiches and salads, Quiche of the Day, a small kids menu and a nice dessert selection. There are appealing items for men…we did see men there, so guys don’t let that stop you. Imagine taking your lady or your daughter there. Awww, how sweet. Pegg House Tea Room is ranked #5 of the 86 tea rooms in NC on TeaMap.com. You can reserve it for parties, showers or luncheons or stop in for lunch during the week. It’s an appealing departure from the every day lunch. If you have a job, you’ll probably feel so refined and relaxed that you won’t be inclined to head back to work, but rather your rocking chair…or hammock. Here are some of the photos we took along with their contact information. This entry was posted in You Should Eat Here! and tagged Kernersville, Lunch on September 25, 2012 by triadfoodies.